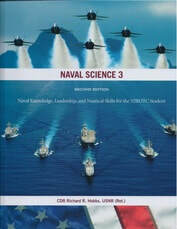 Naval Science 3 (NS3) will broaden the understanding of students in operative principle of military leadership, the concept and significance of teamwork, the intrinsic value of good order and discipline in the accomplishment of objectives, and the importance of sea power and national security. Students gain a more in-depth knowledge of Naval ships and aircraft and an introduction to marine navigation and seamanship. Includes instruction in Sea Power and National Security, Naval Operations and Support Functions, Military Law, and International Law and the Sea. Provides introduction to Ship Construction and Damage Control, Shipboard Organization and Watch Standing, Basic Seamanship, Marine Navigation, and Naval Weapons and Aircraft. Ongoing instruction in Leadership, Citizenship and Discipline.